Discussion in 'Online Games - News and Reviews' started by Kotsy, Jun 11, 2013. An original online video fruit slot with a twist from Novomatic! slots come to life and players will enjoy them even more. Novomatic online video slots are some of the favorites for all online players. It's now time to step into the world of the online video slot Mega Joker. he completes a winning payline, I'll take the smirk or the smile. I love it when he is stacked and increases my winning paylines. and winning combinations are. Always nice to see what you're spinning for before you start the game. right with the exception of the Scatter Star symbol that can pay out on any payline when you receive 3 or more. The highest payout for this online video slot is receiving 5 Scatter Star symbols. If you bet the maximum per spin, your winning will be more than mega! The Mega Joker™ is wild and can appear anywhere on the reels. He will substitute for all symbols except the Scatter Star. When the Mega Joker™ appears stacked in a winning payline, you can bring in some great winning combinations. That will surely bring a smile to my face. Other winning symbols are Red and Gold 7, Strawberry, Pear, Grapes, Watermelon, Plum, Orange, Lemon and Cherries. All fruit symbols and the Sevens can also be stacked symbols to help achieve winning combinations. But the ultimate would be to get a whole screen of stacked Mega Joker™ symbols. Could you imagine what your payout would be if you bet the max? It would be an OMG win. I love it when Novomatic takes a classic video slot and adds something special to it. Many times I find myself going back to the classics and then I find a classic video slot with a twist. Get spinning today and see what you're missing. 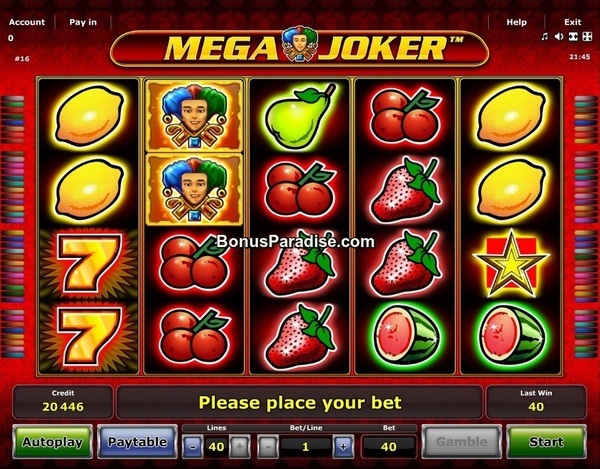 Play Mega Joker™ Online Video Slot at Star Games today. It's a classic that bring some familiarity to your slot playing and you will surely enjoy this one. I think Mega Joker will be one of my favorites from the Novomatic Slots. Stargames doing a good job with adding new Novomatic Slots. Mega Joker is live at Stargames, did you try your luck already?